Show off your practical side with Shibui’s pretty “Crete”! Show off your practical side with Shibui’s pretty “Crete”! How can such a super-luxe shawl be practical? We’re glad you asked . . .
“Crete” dresses up any outfit, its generous rectangular shape draping easily over your shoulders to add an easy neutral or pop of color to whatever else you’re wearing. Easy is practical! “Crete” is a perfect transitional wrap, warding off chilly summer evenings and moving seamlessly into the fall. Season-spanning is practical! 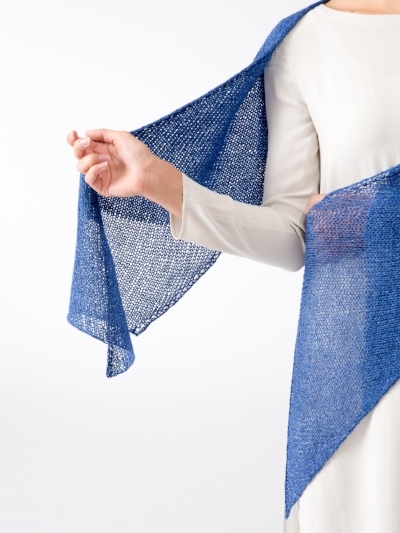 “Crete” is free from Spun with the purchase of appropriate Shibui yarn. Free is practical! Come in to Spun any time before Labor Day to pick up your yarn and a copy of the pattern. When you’re finished with your “Crete,” post a picture to Facebook or Instagram, tagging @spunannarbor, email info@spunannarbor.com, or bring your wrap in for show-and-tell at the shop. You’ll have a pretty (and practical!) new accessory. You’ll be entered into a drawing to win a $50 Spun gift card just for participating. You will be entered into a second drawing to win a $70 Spun gift card if you finish your “Crete” by Labor Day.